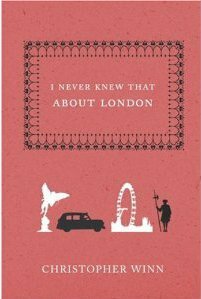 While browsing at a bookstore in London last year, I became interested in a small volume titled I Never Knew That About London. Because I already had a teetering pile of books that I was planning to buy, I simply wrote down the ISBN, confident that I could purchase it when I got back home. Much to my dismay, I found that it was only available as an e-book, or as an import. I was planning to go ahead and buy it, or perhaps put it on my shopping list for my next trip. I was recently browsing the Travel section of my beloved McKay's Used Bookstore when what did my disbelieving eyes spy, but a copy of the much sought-after book. And in pristine condition! And a bargain at only $10! It really was my lucky day! I've been reading this little gem for the past few days, and it's just as wonderful as I thought it would be. The author has a real love and admiration for the city, and it shines through in his descriptions of places that can be seen today, as well as those that are no longer around. The book is divided into sections: City of London, City of Westminster, East, West and South. There is also a gazetteer at the back of the book detailing places mentioned in the text, their associated websites, nearest tubes, opening hours and so on. I know I've made a list of places I'd never heard of before that I plan to visit on my next trip! There is also an interesting "I Never Knew That About . . ." section at the end of each chapter, which frequently highlights famous people who lived in the area. The book is packed with interesting facts, such as the one about how most countries outside of the British isles drive on the right because Napoleon was left-handed. I also had no idea that No. 10 Downing Street has over 160 rooms. It looks just like a regular house on TV! The book also explains the origins of many of well-known phrases such as "to spend a penny" and where the measurement for "one foot" came from. Fascinating! If there is any quibble with the book, it is that the illustrations (drawn by the author's wife Mai Osawa) are not all identified, and so sometimes it can be difficult to figure out which building that is being discussed is shown. That's just a minor quibble, however, in an otherwise outstanding and fact-filled book. I'll have to see if I can find this in the library - sounds like a great read, right up my alley. Thanks for sharing! What a great find! I wonder how old it is? It's actually only from 2007, but it must not be available in the US (normally!). Amazon.com only sells it as a Kindle book, which doesn't really help those of us who are "Kindle-challenged!"